While the Kentucky Derby may be known as “The Run for the Roses,” everyone knows what the racers really want to be holding in their hands at the end of the race: that shiny, gold Kentucky Derby trophy. The trophy’s main body is an 8-inch-diameter covered cup made of 14-karat spun gold. Sitting atop the cup is a horse and jockey. The cup and figure are 17 inches tall and sit on a jade base, bringing the trophy to 22 inches and about 3-1/2 pounds. Produced today, as it was initially in 1924. The most well-known contest in the international horse racing circuit, the Kentucky Derby is held annually on the first Saturday in May. The legendary Churchill Downs in Louisville, Ky., is the only track on which the Derby has been run. The Derby is the first in a triumvirate of the sport’s most prestigious races – collectively known as the Triple Crown – that also includes the Preakness and the Belmont Stakes. Although the Belmont Stakes is the oldest race, the Derby is generally considered the most prestigious. “It is the longest continuously run sporting event in America,” says Lane Gold of Churchill Downs. Also, since it’s the first race in the Triple Crown, it tends to get a lot of attention. This year more than 130,000 people will see the race firsthand with millions more watching on television. The Kentucky Derby track is 1-1/4 miles and takes about two minutes to run. In fact, there has only been one horse to run the track in less than two minutes: Secretariat, who finished in 1:59 2/5 in 1973. A maximum of 20 entrants is allowed; should there be too many registered, preference would be given to horses who have won higher earnings in the graded sweepstakes races leading up to the Derby. Horses must be 3-year-old thoroughbreds and, says Gold, “You have to be a Triple Crown-nominated horse to run.” Generally the owners nominate their own horses to run in the three events. Churchill Downs and its Derby Days are synonymous with many traditions, such as mint juleps and the wreath of roses draped around the winning horse’s neck. But one of the finest – and newest – traditions in the Derby is the presentation of the Kentucky Derby trophy. The first Derby trophy was presented in 1924, making it a relative newcomer to the steeped traditions of the blueblood racing crowd. Prior to then, the winners received a silver plate, cup or bowl – there was no set prize. But for the race’s 50th anniversary, Churchill Downs’ president held a contest to design a 14-karat gold permanent trophy for the winner. Louisville’s oldest retail firm, Lemon & Son Jewelers, won the contest with its design of an intricate gold cup and figure. 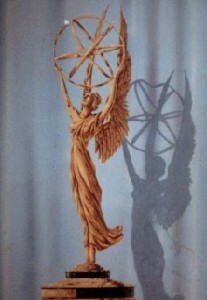 The trophy was designed by George Louis Graff, and Lemon & Son has made the trophy since winning the contest. And just like Southern traditions, not a lot has changed. “It’s made the same way it always has been,” says Gary Rossenberg, Lemon & Son’s general manager. “They use the same original dies that we made in 1924.” The only changes to design were for the Derby’s 75th and 100th anniversary cups, when jewels were added to the cup. Otherwise the base is the only part of the trophy to change: It used to be made of marble; now it’s jade. The manufacturing process begins with a round sheet of 14-karat gold placed in a lathe to create the cup. “The cup is the hardest part to make,” Rossenberg says. “It’s a process called spinning; the gold is shaped around a series of cones and bowls.” The spinning process is a very delicate operation; if the temperature is changed even the slightest during the process, the gold will crack – forcing Lemon & Son to begin anew. This has only happened once, in 1987. But spinning is important because it gives the gold its shiny appearance. “If you were to cast it, you wouldn’t get that finish,” says Rossenberg. The trim – which comprises the handles, rim and stem of the cup – is cast in 18-karat gold and hand-fitted to the cup. After the trim is applied, it is hand-engraved to enhance the detail. The top plate where the figure stands is 14-karat green gold, as is the lotus flower on the trophy’s base. The horse and jockey are made of solid 18-karat gold with a special hand finish. “It takes about six months to make because of all the different aspects to it,” says Rossenberg. He estimates almost 1,000 man hours go into the trophy’s manufacturing, the cup demanding the greatest part of that. During the manufacturing process, approximately 40 percent of the original gold is lost through fillings, engraving, polishing and shrinking. When completed, the trophy is given a home in a lined mahogany box, to be engraved after the race is won. Lemon & Son also makes three smaller sterling silver versions of the Derby trophy. These are presented to the jockey, the trainer and the breeder. Many people think that the jockey receives the gold trophy; but it is actually given to the owner of the winning horse. The large trophy is worth about $67,000 (1998); the price fluctuates based on the value of gold. The sterling silver trophies are worth about $5,000 each, says Rossenberg. At such a high value, you can be sure that two security guards follow the trophy wherever it goes. On the day of the Derby, Lemon & Son brings the trophy to Churchill Downs and locks it up – guarded, of course – in the office of Churchill Downs’ president. Only when it is time to make the winning presentation does the trophy emerge into the daylight on that first Saturday in May. But even such diligent protection can’t prevent mishaps from occurring, says Rossenberg. One year, the governor of Kentucky stepped up to the dais to present the trophy to the winner – and promptly dropped the priceless cup, leaving a big dent. “They gave it back to us and we repaired it,” says Rossenberg. The 1937 trophy is on display at the Kentucky Derby Museum in Louisville, saved from disgrace after being found in a pawn shop in New Orleans. “They had stripped all the gold off,” Rossenberg says. “They even rubbed the winner’s name off the plate. The only way we knew who it belonged to is we put a serial number on the cup.” Lemon & Son took the naked trophy, fixed it up and gave it to the museum. Luckily, most cups make it to their new owners without a scratch. The horse owners this year will be competing not only for the chance to hold aloft that shiny trophy, but also for a winning purse of $1 million, of which the winner takes $700,000. That’s a far cry from the first Derby winnings: $2,850 in 1875. The second-place winner takes $170,000, third place $85,000, and fourth place $45,000. The stakes are high, as is the fee to enter a horse in the Kentucky Derby: $15,000. But it’s worth it to thoroughbred owners and jockeys; the Kentucky Derby has always been a place where the “most exciting two minutes in sports” have led to numerous records being broken and history being made. For example, only three fillies have ever won the Derby. And since 1919, only 11 horses have swept the Triple Crown, winning the Kentucky Derby, Preakness and Belmont Stakes. The legendary Secretariat, a name even nonhorseracing fans will recognize, is one of the 11. And this year on May 2, with millions watching, one lucky and talented horse will nose across the finish line before any other – and while fresh red roses rain down from the stands, the thankful owner will sidestep the sweet petals as he takes the coveted Kentucky Derby trophy. After all, flowers do wilt – and you can’t drink champagne from them. The Larry O’Brien Trophy is a Silver and Vermeil Statue – Basketball on Plinth. Vermeil (pronounced vehr-MAY), is also known as silver gilt, is a combination of sterling silver, gold, and other precious metals. A Plinth in architecture is the platform or base upon which a column, pedestal, statue, monument, or structure rests. The trophy is approximately sixteen pounds and stands about two feet tall and valued at $13,500. It is designed to look like a basketball about to enter a basketball net. The basketball itself is the same size as a regulation size NBA basketball. The NBA Championship Trophy was created, and named as such, in 1977 and is awarded to the winner of the NBA Finals, at the conclusion of every basketball season. 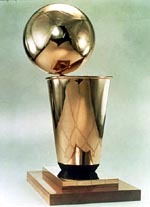 The NBA Championship Trophy was renamed the Larry O’Brien Trophy in 1984 in honor of former NBA commissioner Larry O’Brien upon his retirement. A new Larry O’Brien Trophy is made every year, unlike the Stanley Cup, and the winning team maintains permanent possession of that trophy. 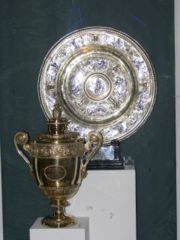 The trophy is engraved with the year and team name, and the trophies are often prominently displayed in the team’s arena. 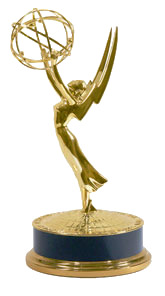 Originally this trophy was called the Walter A. Brown Trophy after the league pioneer and Boston Celtic owner. An earlier NBA Championship bowl also was named after Brown. Lawrence (Larry) O’Brien, a member of Former President Lyndon B. Johnson’s cabinet as U.S. Postmaster General, became the commissioner of the National Basketball Association in 1975. O’Brien was a vital carpenter of the NBA, building basketball interest among fans. Attendance doubled and television revenue tripled during his tenure, while the most recent broadcast of the 2005 NBA Finals reached 205 countries. In 1984, the sport’s annual championship trophy was renamed in his honor of his “Everyday Greatness”.